Whispers in the Loggia: Step Right Up and Get Your... Cassocks? For trend-conscious Roman Catholic priests, this year's must-have is the isothermal cassock, ideal for winter outdoor ceremonies or masses in an unheated church. Retailing at 300 euros (400 dollars), the cassock was one of a host of novelties on display at the annual SacroExpo, the three-day Polish trade fair that wrapped up Wednesday. 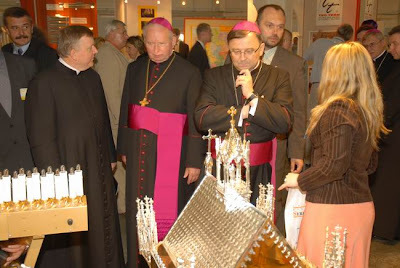 "It's expensive, but if you buy one it'll last a lifetime," claimed Bogumila Niewiadomska, who was running the stand of Pratulin, a small Polish firm specialising in religious vestments. SacroExpo is held annually in Kielce, a town some 200 kilometres (120 miles) south of the Polish capital Warsaw, and is one of Europe's top religious fairs. About 250 exhibitors attended this year's edition, the eighth SacroExpo. It has drawn thousands of priests, monks and nuns from more than a dozen countries, keen to do anything from spruce up their wardrobe to modernise their church. "There are fashions in vestments and liturgical accessories," explained Father Ryszard Rozycki, sizing up a display of altar cloths with computer-designed motifs. "You have to adapt," he added. Father Waldemar, a Catholic missionary who works in largely Orthodox eastern Ukraine, was perusing the stands. "Our church has just been finished. Now all we have to do is equip it," he said, with a twinkle in his eye. SacroExpo provides everything required: chalices, rosaries, hand-sculpted wooden crucifixes, altars, organs, as well as heating systems and even roofing. But Waldemar said there was no question of coming home from Kielce laden with the lot, explaining: "We're interested in everything, but we have to consult the other parish officials before buying anything." For 8,000 euros (10,700 dollars), his church could boast an electronic carillon with more than 1,500 MP3 chimes, recorded by professional ringers from the Netherlands and the United States. "It's still ten times cheaper than buying a set of big bells," said Filip Horvat, of Horvat Elektronika, the Croatian company which sells the system. Horvat said prospects are great in the Polish market. Because soul-winning is impossible without smells-and-whistles. Not to mention MP3 bells.